Following a heartbreaking loss to Hawai’i last Saturday, the UC Irvine men’s basketball team bounced back against rival Long Beach State and earned a 90-67 victory in the battle for second place in the Big West conference. Five different ‘Eaters scored in double digits on the night and with the victory UCI improves to 21-8 overall and 10-3 in conference play. The defeat halts the 49ers’ (15-13, 9-4) six game winning streak and pushes them back to third place in the conference. Nelson turned in a near perfect game, in the rout against Long Beach, making nine of 10 shots from the field and six of seven shots from deep to accumulate to a team high of 25 points. Junior guard Luke Nelson turned in a near perfect game shooting 9-10 from the field and 6-7 from beyond the arc. Junior center Mamadou Ndiaye also chipped in offensively garnering 20 points with nine rebounds and two blocks. Ndiaye has been efficient as can be in his last three games, converting 19 of his last 22 shots. “When we move the ball well and Mamadou works hard, like he did tonight to get in position for the catches that he got, and we deliver the ball to where it needs to be […] he can be dominant.” said Turner. With senior guard Nick Faust being held to a season low three points for the contest, Long Beach had to look elsewhere to carry the effort offensively. 49er sophomore Justin Bibbins scored his career high of 26 points, off a perfect 15 for 15 shooting from the free throw line, but his team could not keep up with the ‘Eaters’ hot second half shooting performance. 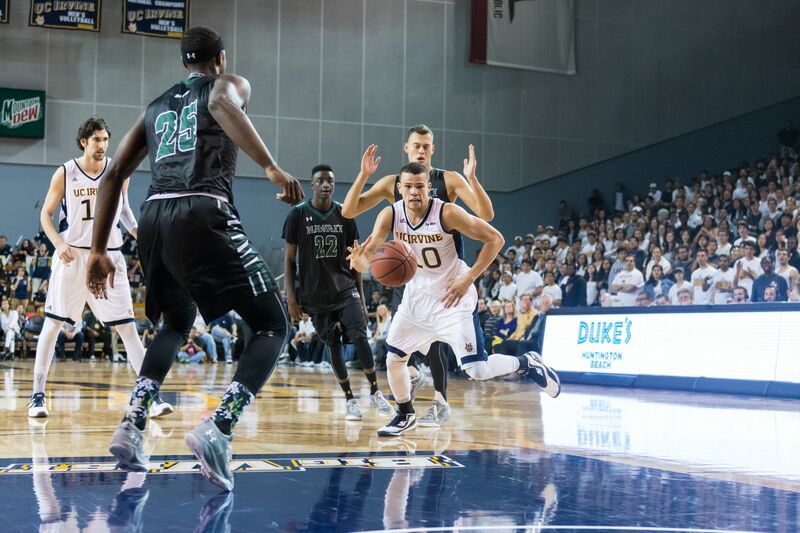 After a quick first half spurt by the 49ers hopping to an early nine point lead eight minutes into the game, the ‘Eaters began to put the clamps down on defense and proceeded on a 19-5 run to take the lead for the rest of the contest. Long Beach’s offense was heavily reliant at their opportunities from the free throw line, making 25-27 of their total attempts on the night, but could not keep up with the ‘Eaters’ hot 64 percent shooting in the matchup. The second half of the game was all ‘Eaters with their lights out display on offense, shooting 79 percent from the field and 78 percent from beyond the arc. Long Beach had difficulties scoring from the floor in the second period shooting just 29 percent and solely leaned on getting points from the charity stripe. Both Ndiaye and Nelson went the second half without missing a shot and ultimately put the exclamation point on this chapter of the Black and Blue rivalry and pushing the ‘Eaters as sole possessors of second place in the conference. “I think that this team has the potential to be really good and we’ve maybe not been able to consistently been good enough to reach that potential up to this point but that’s why the season is played all the way through March and we’ve got the opportunity to keep getting better,” said Turner. The ‘Eaters will travel to Davis to face the Aggies on Saturday before holding senior night against Cal Poly next Thursday at the Bren for an 8:30 p.m. tipoff.